Setting a wedding date is one of the first things you have to do when planning a wedding. However, it’s not the first. 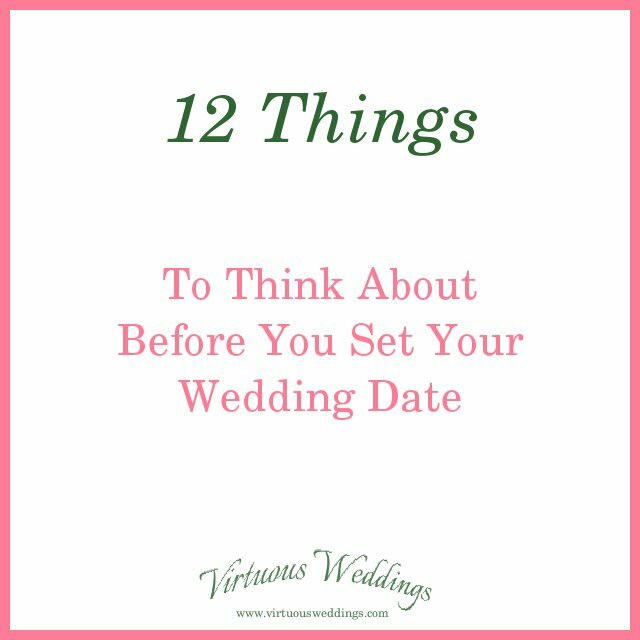 Here are twelve things to consider before you choose your wedding date. #1 Birthdays, Anniversaries, and Other Events. . .
. . . in your own lives and the lives of your close family and friends. Do you want it to be the same day as another family occasion? Will it interfere with annual birthday parties or anniversary trips? Will it just be a busy time of year? Will it be a pricey time of year for the family? Some appointments can be moved, of course, but it’s worth checking. A wedding near a holiday (especially a big one!) may interfere with traditional celebrations or guests already-made plans. It could force guests to choose between your wedding and family events. Other reasons to be wary of holidays: they’re often busy times already, traffic may be heavier, travel may be difficult, lodging could be scarce, and prices could be higher. Will immediate family, good friends, and chosen attendants actually be available? Do they have already set-in-stone plans that weekend? Can they travel then? What is work ~ for you or immediate family (and attendants) ~ going to be like then? Is it compatible with a wedding? What are the responsibilities (that can’t be adjusted) of key people? No one needs a too-full schedule! If you, immediate family members, or close friends have other responsibilities, could they interfere with your wedding? Can it really all be done at the same time? Local events, where you live or where the wedding will be, can impact your wedding. Consider traffic, lodging, availability of services, and pricing. Will it be available? Secure your location before you choose a final, definite date. Prices vary with the season (especially around holidays). This could be to your advantage (if you have your wedding in the “off-season”) or your disadvantage (if you have your wedding at a popular time or near holidays like Christmas, Valentine’s Day, or Mother’s Day). Give some thought to things that are most important to you (location, musicians, flowers, photography, catering, etc.) and check prices before you set your date. What will the weather likely be like then . . . and what could it be like? This isn’t just about where the wedding will be held, it’s also about where family and friends have to travel from and through. This one may seem really strange! You can’t know what condition you ~ or anyone else ~ will be in by the time the date rolls around, but I think it’s still worth considering. If you have a friend (the bridesmaid type) with a chronic illness that is worse at certain times of the year, avoid those times, if possible. If your mom always gets a cold every December . 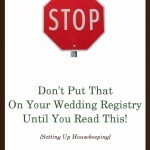 . . don’t even consider a December wedding. Just don’t do that to her! If you dad has horrible spring allergies, consider steering clear of a spring wedding. If you have grandparents with failing health, consider how quickly it’s failing. How likely is it they’ll still be with you (and up and around) in six month, nine months, or a year? Have you chosen a wedding date? How did the above factors affect your decision (or how are they affecting your wedding)?